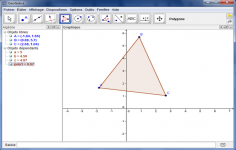 GeoGebra is, as its name perfectly suggests, a comprehensive educational utility of mathematics - algebra and geometry. Suitable for all college students, it allows them to work algebra, analytic geometry and calculus, being able to represent geometric figures, graphs of functions and change in real time. With its simple and intuitive GUI, the application can be used as a learning tool but also for presentation or editing. As a dynamic geometry system, it lets you create geometric constructions through points, vectors, segments, lines, polygons, angles, conical, etc. The plots are created by selecting points and lines in the plane, while its size modified using the mouse. The whole process of construction happening in real time. The same applies to the equations, vectors, directions, slopes, analytical calculations, etc. This software also allows you to print graphics, export them as an image, and create interactive web pages. Its new interesting features such as a compass, cones, automatic dressing a regression and recording in a spreadsheet offers more flexibility and fun in learning and teaching. If you are a teacher or a student or you just love mathematics, this tool offers an interesting method to learn and test your knowledge.